Let’s be honest, family life is hectic, especially when you have a young family. Which means that adding extra stress to your plate isn’t always a good idea. However, when it comes to family, we do what is necessary. Just like you are caring for your little ones, your aging parents (and other relatives) spent years caring for you, nurturing you, ensuring that you grew up having a happy and safe childhood. Today, the tables have turned – your loved ones are aging and they now require your help and care. Of course, the issue is that juggling family life and caring for an aging relative is no easy task. It’s so important that you are mindful of the steps you can take to make caring for a loved one easier on yourself and the rest of your family. An important factor to consider is their changing needs. You don’t want to just think about the care that your aging relative requires now, but also the care that they may require in the future. The fact is that as time passes, the amount of care that they will need will most likely increase. That’s why it’s so vital that you carefully consider their changing needs. If you want your loved one to remain in their home but you can’t physically care for them yourself, then you might want to consider hiring a professional caregiver. They could come in once or twice a day to help your loved one shower, get dressed and take their medication. Or, you may require someone to be there constantly. Of course, if 24-hour care is required, then you may want to consider a nursing home, despite the fact that there can sometimes be problems in nursing homes, most facilities are nice places. It’s just a case of properly vetting them and being aware of the signs of elder abuse. The good news is that there is some free help available via the government. There are grants that you can apply for to help make caring for your loved one easier and more affordable. You may also be entitled to some free care for them, such as a set amount of hours per day. There are lots of options to explore, it’s just a case of making the time to do so. 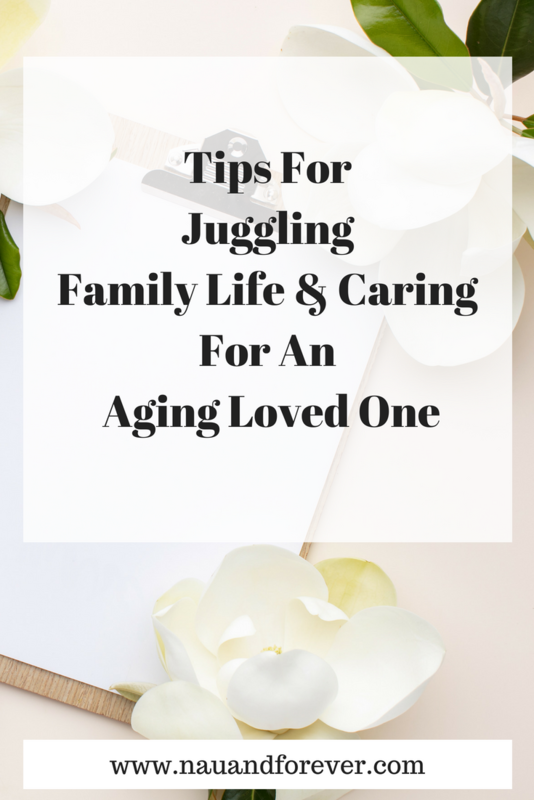 It’s not easy juggling life with a young family and caring for an aging parent. Our parents took such great care of us, we should want to return the favor. You can find a balance where everyone feels loved and cared for.